The next sphere, which comes after the “Leader”, specializes in the combat and everything connected with it. Sometimes the easiest way is the best way, how to deal with the menaces of the encounter deck. If you need to deal with all these nasty badasses, orcs, spiders, trolls, or even darker servants of evil, call to the fight Tactic sphere. Build your army, equip them the axes, swords and plates and send them right into the heart of the battle! Don’t be afraid of the enemies, face the terror and fight with a true strength and courage! This sphere helps you to call the best warriors, proffesional soldiers and other friendly creatures in order to protect you. The engagement area becomes the main scene, where the important events will take a place, and where it will be decided about your fate. Our first hero of the Tactics sphere is an expert in destroying enemies. Just put Gimli in the middle of the fight and prepare for the bloody massacre, where no orcs, spiders, wargs, trolls, and other nasty foes would survive. Yes, Gimli is without any exaggeration the strongest killing machine, that you will meet in Core set, maybe in the whole LOTR LCG. If you encounter some strong enemy (like Ungoliant’s Spawn, Hill Troll, Nazgul of Dol Guldur), this Dwarf is a good choice to eliminate their menace. Same as Aragorn, his stats show him as a universal hero, who is able to help you in any role and situation. 11 starting threat is the understandable cost for notable stats and great ability; you have to count with it. 2 Willpower can help you when no enemy is in your sight. 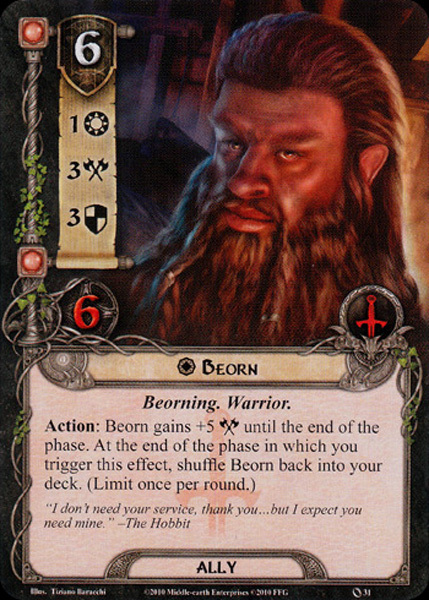 In addition, you won’t meet many Tactic characters with more than 0 or 1 Willpower, so Gimli is the rare exception, at least in the Core set environment. Attack with 2 value doesn’t look so remarkable, but you’ll find that Gimli’s attack is very variable. 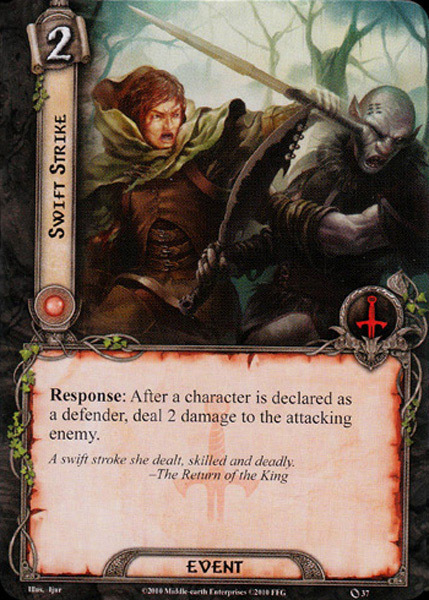 At last, 2 Defense and 5 Hit Points shows Gimli as a capable defender, similarly to Aragorn; these two heroes are only characters in the Core set, who are able to survive one non-boosted attack of Hill Troll, the feared enemy in Core set. But while Aragorn has no profit from any damage at him, with each point of damage on Gimli bloodthirsty berserk grows under your hands. 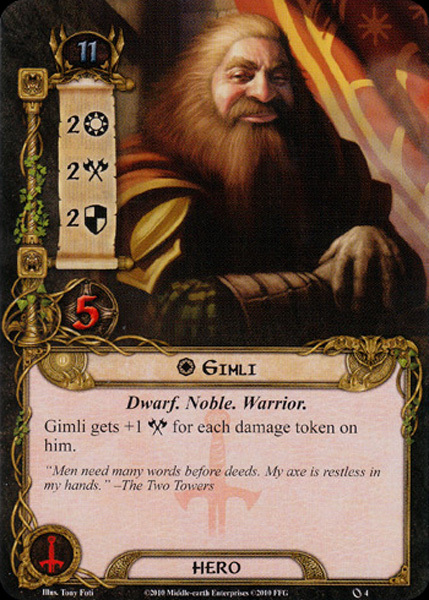 1 damage token on Gimli means +1 Attack for him. So easy, so cool. You have to get over Gimli’s Defense, which stands in your way, paradoxically. So defend some strong enemy with 4, 5, 6 Attack, or let enemy’s attack undefended and allocate damage to Gimli. In next turn strike with his boosted Attack (which can reach 6 Attack without attachments) and smash any enemy into small pieces. Of course, it would be a shame to not utilize any attachment on Gimli, like Citadel Plate. With extra 4 Hit Points, the potential of this hero grows even more. Don’t forget, Citadel Plate is not only attachment, which can boost his Attack. Add to your deck Dwarven Axe, useful weapon and the great helper to destroy strong and hardy enemies. So you can easily count that Gimli’s full boosted Attack can reach an unbelievable value of 12, regarding Core set. If you additionally attach Unexpected Courage to Gimli, then you can everything manage just in one round, without waiting. Defend, prepare, attack – what a deadly combination. Is there any negative related to Gimli? Maybe. You have to count with some treacheries and shadow effects, which are able to ruin your Gimli, in extreme cases send him to discard pile. 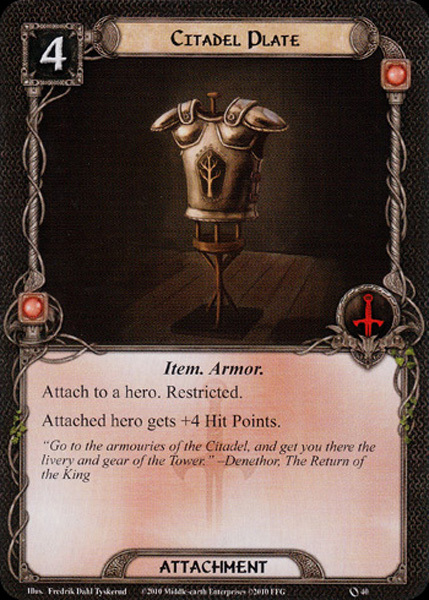 Although in Core set exist few encounter cards, which would discard an attachment from Gimli (for example shadow effect of Forest Spider, or Cavern Guardian) as you collect other adventure packs and expansions, this kind of effect is becoming more common. Just get to know scenario you play and use Gimli wisely. There is no more lethal to him than just discard Citadel Plate from him in a moment when damage exceeds Gimli’s default Hit Points. If we consider Gimli as a heavy bloodthirsty tank, then Legolas is fierce, silent murderer, who kills enemies from the safe distance like a sniper. He is our only Ranged hero, what makes from him almost superhero in a multiplayer environment. In solo games its usefulness may be partial, however, he can be used at least for his interesting ability. I think that 9 starting threat is amazing, considering its ability and overall strength. I wouldn’t be surprised for 10 or 11 starting threat, but elves are commonly silent creatures, so higher starting threat wouldn’t make a sense from a narrative view. 1 Willpower shows that Legolas won’t be a good quester. 3 Attack is an excellent default value for the attacker. Last, 1 Defense and 4 Hit Points definitely predestine Legolas as a specialist in attacking and killing foes, in addition to keyword Ranged and so other players can profit from his strength. Legolas is only Tactic Core hero, where stats reflect his role perfectly. You know what to do with him, unlike Théodred or Thalin, where stats are distributed oddly and their roles are followed directly by their responses. The ability of Legolas flawlessly supports his attack effort: after Legolas kills an enemy, place 2 progress tokens on the current quest. Tactic sphere excels in destroying enemies, however, when you need progress in a quest, you have a problem. Gimli is the only character with Willpower higher than 1, but you need to save him for other important tasks. Mostly, Tactic characters have 0 Willpower, so if you run solo-monosphere Tactic deck, then you will be stuck in a quest for sure. The response of Legolas compensates a little bit this weakness, but it is not self-salvation. Keep in mind that. And what exactly means “place 2 progress tokens on the current quest?” This has been mocking me for a while. Remember: when you add tokens on the current quest, it includes also active locations, if that location isn’t immune to player’s card effects or if you can’t choose to bypass location. LOTR FAQ reminds that, you can check it out. This is the difference from the effect of Misty Mountain Goblin, where you are removing quest tokens directly from a quest, never from an active location. Another very good thing about this ability is adding progress tokens during the combat phase. Why is that important? The particular stage of some scenarios is mostly designed for “hurting you” after quest phase. Remember on the third stage of Journey Along the Anduin, Ambush on the Shore: when you reveal it, reveal 2 cards per player from encounter deck and add them to staging area… In other words, there exists a high probability that you will encounter more enemies that could ambush you immediately. After staging you theoretically can meet 4 other enemies. And in many cases you appear in this stage with high threat value, so count with that you engage almost every enemy in the staging area. That could be the catastrophe. With Legolas, you are able to “bypass” this situation when you add progress tokens not just before encounter phase, where you engage enemies, but after combat phase, where you needn’t be afraid of “sudden ambush”. Enemies remain in the staging area and you can prepare and deal with them one round after. It only needs a little bit calculating. I admire that with new adventure packs and expansions Legolas get better and better because of some good attachments and events that aim at Ranged or Silvan keyword. But I wouldn’t spread more spoilers, you will see for yourself. Legolas works for Tactic sphere well and perfectly performs the role of the attacker with little signs of questing, thanks to his ability. 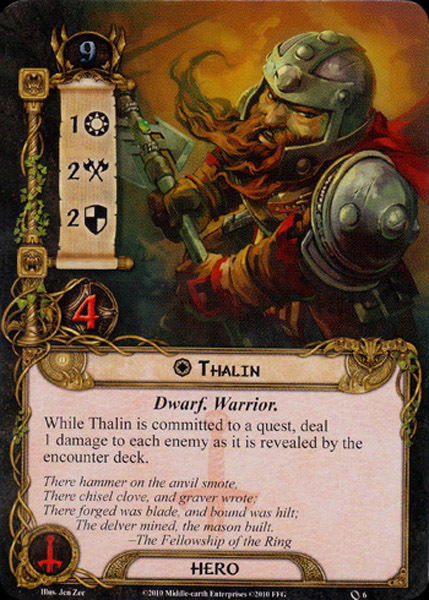 Core set brings us last Tactic and Dwarf hero named Thalin. I’ll start with commenting his stats without any delay. As Legolas, 9 starting threat isn’t bad at all and responses to his overall strength. 1 Willpower, 2 Attack, 2 Defense and 4 Hit Points makes from Thalin hero with a good set of stats, where he is able to give us helping hand in attacking or defending. Do you remember Théodred? You should, because despite Thalin’s stats, the main role of this hero is questing. With 1 Willpower really? Unfortunately yes. Thalin has exactly the same problem as Théodred. He is predestined for some role but without property stats, which should support his effort. It is another “WTF?” effect again. I would be happier with stats like 2-1-2-4 or something like that, however, what happened… happened. I wouldn’t comment this “bug” anymore. Of course, the main reason for committing Thalin to a quest lies in his ability. And I would say pretty useful ability – when you commit Thalin to a quest, you deal 1 damage to each enemy just revealed from the encounter deck. Ability had to be explained in LOTR FAQ additionally, because it may cause confusion. If an enemy (with 1 Hit Point) has any “When revealed” effect or keyword (such as Surge), you may ignore that. This question was related mainly to Eastern Crows. So if you commit Thalin to a quest and Eastern Crows are revealed, deal 1 damage to this enemy and kill it without resolving Surge keyword. However, the Forced effect is still valid and you have to shuffle crows back to encounter deck. This is whole magic. 1 damage is a good start for enemy elimination, primarily for any enemy with high Defense. Thalin’s ability works well in combination with other direct-damage abilities. For example Longbeard Orc Slayer, who deals 1 damage to all Orcs after he enters play. In some scenarios, where Orcs may take over whole staging area and/or your engaging area, combo Thalin-Longbeard Orc Slayer can inflict noticeable damages to their formations. Incredible enemy-purifier, though it is a little bit expensive. The more accessible and cheaper way to hit enemies before they’ll do it you is using combo Thalin-Gondorian Spearman. Although it doesn’t affect more enemies at once, you can reduce the number of weak enemies with 2 Hit Points one by one, and, what is very cool, without counting any Defense! In addition, you don’t need to include to your deck Leadership sphere as in the case of the combo with Longbeard Orc Slayer. Thalin can also work together with quite interesting event Swift Strike, which deals damage 2 damage after defender is declared. 1 damage from Thalin and 2 from Swift Strike without any scratch – sounds really good for you and bad for a poor enemy. For Thalin I have more comprehension than for Théodred. I know that Théodred’s ability with the resource generation may help you a lot. Nevertheless, I actually welcome Thalin at my side with greater enthusiasm, because dealing direct damage to enemies just fits more into my own playing style (with help of Gondorian Spearman and/or Swift Strike). I know that Thalin in LOTR community doesn’t belong to the most popular heroes, however, he has a certain quality that we shouldn’t just ignore. Now we look at the first Tactic ally, known for their strength in battle and also their weakness for any wisdom. Veteran Axehand is distant “vanilla-cousin” of Leadership Guard of the Citadel. No other allies have blank text under their traits (excluding narrative text). However, where Guard of the Citadel didn’t match for any role, his Tactic colleague adapts for at least one task quite well. 2 cost for an ally is a good default value. As we anticipate, 0 Willpower is an actually normal phenomenon in the Tactic sphere, so we can’t be surprised by that. The further stats, 2 Attack, 1 Defense and 2 Hit Points shows Veteran Axehand as a competent warrior, able to attack and maybe defend one under-average attack. If you remember my opinion to distribution stats at Guard of the Citadel and overall stats strength (=OSS), now you know, about what I was talking about. OSS of Veteran Axehand is 5. Guard of the Citadel has only 4. For the same cost. Here is the first advantage over the Leadership vanilla ally – you have the stronger ally with the bigger portion of OSS. You may also remember at Guard of the Citadel’s review, how I said: “1-1-0-2 looks illogical, uselessly and moreover expensive. Seems to me as the worst stat combination for 2 cost character I could think up.” Compare to Veteran Axehand with 0-2-1-2. Yeah, he gets 1 additional stat point, so he has the numerical advantage, but you see that stat distribution seems more logical. We have an ally with the predestined role – the role of attacker. 2 Attack for 2 cost is an appropriate value, fairly good and noticeable in attacking mission. In addition, 1 Defense Point with 2 Hit Points is a quite nice cherry on a cake. He can protect himself against annoying Eastern Crows or Black Forest Bats and defending enemies like Wolf Rider, Misty Mountains Goblin or Dol Guldur Orcs needn’t mean KO necessarily. His trait Dwarf is what can Veteran Axehand raise up. It’s shame that everything I’m writing right now must be marked as a spoiler because in Core set we don’t meet any Dwarf-synergy card. !SPOILER! 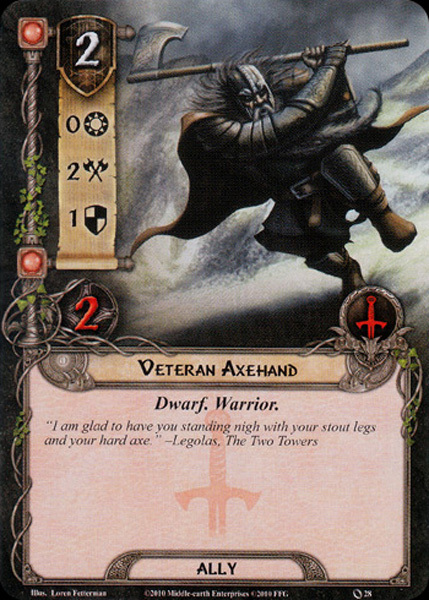 The usefulness of Veteran Axehand supports next expansion Khazad Dum. Before that, we can rely on Dáin Ironfoot and his permanent ability +1 Willpower and +1 Attack to all Dwarf-characters. So for 2 cost we get perfect infantryman with 1-3-1-2 stats. In Khazad Dum and further adventure packs, we can look forward to Dwarf-boosting-events like Durin’s Song or Khazâd! Khazâd!. These and further Dwarf-cards makes from relatively “weak” vanilla ally an extraordinary vanilla ally. If I should mention any negative connected with him, there won’t be much of it. The blank text makes me feel bad a little bit, but stats are good by themselves. Last, I absolutely understand that every ally can’t make all things just perfect. But when you run solo Tactic deck, this guy won’t help you with any amount of Willpower. The Willpower lacking is Achilles heel of this sphere and Veteran Axehand represents this kind of weakness of Tactic. Veteran Axehand belongs to better cheap allies and he deserves the place in your Tactic deck, at least for a couple of adventure packs and expansions. The community really likes him and I see him as a sympathetic fellow with a good reputation. Here comes another cheap ally with the same cost as previous Veteran Axehand. Core Tactic sphere offers pretty good allies. Each of them could find a way to your Tactic deck. And it isn’t only because of the relatively small number of Tactic allies (4), but their stats and/or abilities make them useful. Gondorian Spearman has 2 cost. For that, we get 0 Willpower, 1 Attack, 1 Defense and merely 1 Hit Point. So at the first sight, this ally looks like under-average ally with not fascinating stats. Thanks to designers, Gondorian Spearman doesn’t belong to “vanilla allies” with blank text but has in a pocket some nice tricks. The first one is keyword Sentinel. Okay, Sentinel for 2 cost, with 1 Defense and 1 Hit Point. Still, I wouldn’t be persuaded by some quality of this ally, but at least it would be a flexible ally, who could defend other players. If you remember well, the last character with Sentinel was perfect Aragorn. And that was a hero. Gondorian Spearman is first and simultaneously only Core ally with this keyword. That makes from him something special. 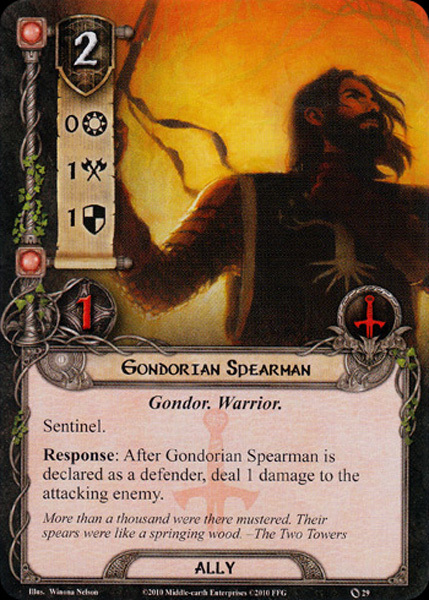 However, the real power in Gondorian Spearman hides in his uncommon, but very practical Response: “After Gondorian Spearman is declared as a defender, deal 1 damage to the attacking enemy.” Direct damaging can catch your attention for sure. There are no plenty of cards, which can deal automatic damage. Thalin and Longbeard Orc Slayer deal 1 damage, but one is a hero, so probably you won’t have him to disposition every game, and second is an expensive and situational ally from Leadership sphere. I guarantee you will use Gondorian Spearman more often than any of mentioned character-alternatives. The ability states that after you declared this ally as a defender, you deal 1 damage to the enemy, who attacks him. Damage comes first. This is an important finding because in some cases Gondorian Spearman can survive the attack of even some stronger enemy, which would normally destroy your fellow. The precondition is that you have to kill the attacking enemy, just before revealing his shadow effect. Excluding 1 Hit Point Black Forest Bats and Eastern Crows (Gondorian Spearman destroy them alone in any case) you can kill any enemy with remaining 1 Hit Point without considering “with whom I’ll defend?” Gondorian Spearman’s ability works really well with hero Thalin, who also deals 1 damage. This combo makes from foes like Cavern Guardian, East Bight Patrol or Wolf Ride only poor crushed corpses. I would mention the third to the party, Longbeard Orc Slayer, but I doubt that all three characters would appear in a single game at the same time. In short, it is unlikely and overcomplicated. The combination of cheap cost, Sentinel and great ability makes from Gondorian Spearman worthwhile ally and flawless chump blocker. 1 Defense and 1 Hit Point, unfortunately, doesn’t allow to using this ability for very long. Often you discard him after one attack if you don’t boost him by For Gondor! In rare occasions, you have time and space to save him for defending enemy with remaining 1 Hit Point. However, you shouldn’t miss this ally in your Tactic deck. For a long time, he will belong to essential “basic stone” of your army. As we had duo Guard of the Citadel and Veteran Axehand, our third Tactic ally looks like exactly as his Leadership colleague, Silverlode Archer. He is called Horseback Archer and except his keyword, he is our last Core set “vanilla-ally” we are meeting. It’s interesting that Guard of the Citadel and Silverlode Archer have their twins in Tactic form. They differ only minimal. But that “minimal” difference makes from both Tactic allies more perfect companions. Horseback Archer costs 3, so he isn’t a cheap ally, same as Silverlode Archer. But stats are telling us a different story: 0 Willpower, 2 Attack, 1 Defense and 2 Hit Points. Compare with his Leadership colleague: 1-2-0-1. Overall stat strength (=OSS) is equal to 4. Horseback Archer, for the same cost, has OSS equal to 5. This simple comparison should persuade you that this Tactic ally is just stronger, that means more useful and more valuable. See at his distribution of stats, my favourite indicator. 0 Willpower at Tactic ally I won’t comment anymore, we know all, it’s common value. Next, 2 Attack is a noticeable contribution in attacking effort, especially at ally with Ranged keyword, so remarkable skill in a multiplayer environment. Here Silverlode Archer has also 2 Attack, so nothing new. The important difference lies in defending potential. Where Silverlode Archer will die even after scratching from Eastern Crows or Black Forest Bats, Horseback Archer will stand without injury and can defend enemies with 2 Attack, thus he survives at least some attack. Horseback Archer is just Veteran Axehand with Ranged keyword and a little bit more expensive. There isn’t much to talk about him, because I would only recycle the same words from the review about Silverlode Archer, or review about Veteran Axehand. Hence, we can analyze only his trait, without mentioning Archer, what is unusable. We have already talked about Dwarf (Veteran Axehand), Gondor (Guard of the Citadel) and Silvan (Silverlode Archer). Rohan trait is closest synergy trait, we will get to know. Not in Core set but in closest adventure packs, so I’m sorry for another spoiler. !SPOILER! 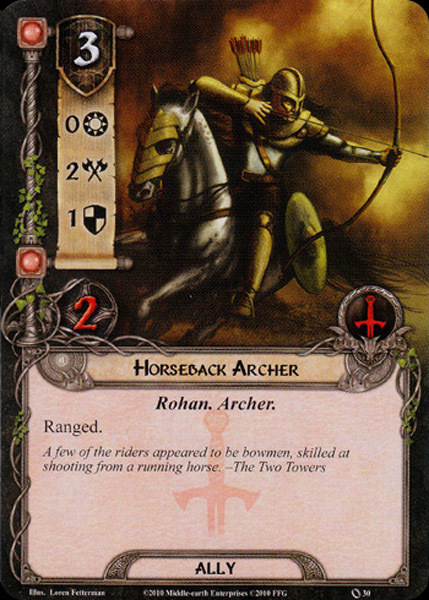 Horseback Archer can be boosted by some Rohan cards, from which some of them don’t make great combos. I would mention Astonishing Speed, which adds +2 Willpower to all Rohan characters. I know that Horseback Archer is created for combat phase, not for the quest one. However, Willpower in Tactic sphere actually doesn’t exist, there are no some good Willpower allies, no supporting events or ability. Astonishing Speed can improve Horseback Archer by this way at least for one phase. You can sacrifice him for one round and call him to quest duty. !SPOILER! because Eagles are coming! But if you are thinking about adding of some Ranged allies, pick Horseback Archer from Tactic sphere. He is really better Ranged option than poor and badly done Silverlode Archer. Fourth Tactic ally from Core set is also the last one from Tactic sphere. After seven Leadership allies, where we have many choices, Tactic offers only four allies, from that this one belongs to “expensive elite”. Meet the real embodied rage and strength, who can easily compete with the worst and most dangerous enemies. Beorn comes to the scene and is prepared for deep analyzing. Beorn costs 6 resources, same as at Brok Ironfist. But we have to realize we are moving in the Tactic sphere, where we can’t rely on resource generation and acceleration. In general, it takes a longer time to put this ally into a play (though Horn of Gondor can speed up his arrival), so count with him rather in a late game. But let’s have a look on Beorn’s stats, what primarily interest us. With 1 Willpower we hardly can make some miracles in the questing phase, in addition, sending him to a quest wouldn’t be a wise idea in the context of other stats and of course his ability. Now it becomes interesting. 3 Attack is brilliant value even for a hero. But for an ally? It’s just phenomenal! 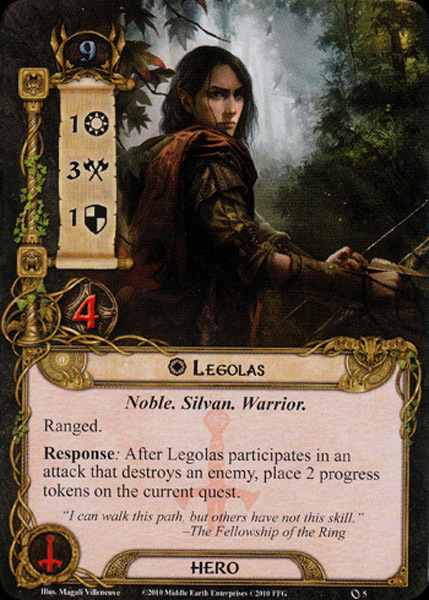 In Core set, no ally could compete with its strength, except our mighty friend Gandalf. Attacking with 3 can blow up at once weak enemies like Dol Guldur Orcs or Hummerhorns. And attacking the same enemy twice will destroy the majority of average enemies (Wargs, King Spider and others). And still that’s not all – when I finally get to analyzing his ability, you find out that it is only a small part of offensive strength, which hides in Beorn. We are continuing by Beorn’s defense potential. 3 Defense is another superb value for an ally, unparalleled and simultaneously very useful. He protects himself against the majority of enemies, which attempt to hurt him somehow, but commonly Beorn escapes without any scratch. And when some more tenacious enemy with higher than 3 Attack want to hurt our ally? The forces of evil have to prepare for a pretty long fight – if they overcome 3 Defense of Beorn, hardly believable 6 Hit Points is waiting for them. That amount of Hit Points are even heroes lacking. 3 Defense with 6 Hit Points resist attacks of Hill Troll, Ungoliant’s Spawn or wisely boosted Chieftan Ufthak. In comparison with Brok Ironfist, who has “only” 2-2-1-4 with OSS 9, Beorn can pride on 1-3-3-6 with OSS 13. And both are for same cost 6. The difference between them is immense, from the view of stats or even abilities. Yes, I finally get to Beorn’s action, which makes from him the real uncontrolled beast. Once per round, you can add him +5 Attack until the end of the phase. After that, Beorn returns to your deck, where you have to shuffle him. You surely use Beorn’s ability in a case of highest emergency. If you need to destroy some annoying enemy with the huge amount of Hit Points, Beorn can change himself in the furious monster, who participates on the killing of such enemy, with the support of other characters. But for that, you have to pay by removing him from a board back to your deck. If you do this, say “bye” to your “super-ally”. It’s a small chance you draw him back to your hand. Of course, 2 or 3 copies of him would increase the probability of drawing and playing him again. But rather the game will end than it would happen. From this point of view, I see this ability usable in two cases: 1) when nasty enemy threaten you and at the same time your game is in a big danger, or 2) you are in the phase of the game, where there is no doubt about your winning. So you can afford to do this maneuver. Ability is rather specific, it doesn’t worth to use it in a common situation because then you would irresponsible waste your resources for Beorn. Summarizing Beorn, he is a very powerful ally, strong like a bear and tough like a rock. His 6 cost though makes from him very costly matter, and because of that you commonly will have a problem to get him into a game. But his appearance will make your game simpler. I would add one or two copies of Beorn to your deck if you have a free place for him, and the problem with the scarce resources is somehow resolved (by Horn of Gondor, Steward of Gondor etc.). Only then can probably Beorn appear in the game and unleash his brutal force in order to defending and killing all menaces of the encounter deck. I like the Tactic events – they are cheap, simple and effective. Many of them are usable even until these days. Blade Mastery could be an example of such kind of events. This 1 cost event has an Action: “Choose a character. Until the end of the phase, that character gains +1 Attack and +1 Defense.” I can’t imagine an easier card. You have no preconditions for playing this card. Every character can benefit from boosting of Blade Mastery and you don’t have to choose between one or second type of boost. Your character just gets both +1 stats at once. Truth, it’s the one-time effect, so after phase character’s boosted stats fall back to default stats. But for an event, this is a logical effect. If you want to something more permanent, attach to a character some attachment. Well, we have a very flexible event, where you can choose any character in the game and add him that stats-adjustment, what is another positive. Heroes or allies, yours or others. But from now it is a time to get to the main effect and comment it more deeply. I’ll take it from the back. Surviving of your characters is maybe the key aspect of all games. You try to save heroes from death and sacrifice weak allies and chump blockers. But what if we have a good ally, who also deserves to live and thus other protection? What if we are run out all allies and we have only wounded heroes, with unpleasant prospect to future? Blade Mastery can be the one-time answer. In the right time and right place, it can save your character. But there is another treacherous element, which complicates our plans – the shadow cards. Shadow cards, given to our enemies, could be that little detail, which can decide about life or death of your character. Additional +1 Attack or +2 Attack (for example Wargs) can with bad luck thwart Hit Points or even life of your hero or ally. Blade Mastery can protect character completely or at least partially from shadow cards and keep him alive. The second positive effect is mentioned +1 Attack. If attacking troubles you more than defending, +1 Attack is always a useful boost. Many times you get into a situation, where to knock out the enemy you need at least one mere Attack point. Again, Blade Mastery will help you with it. Finally, together with some readying effect (Unexpected Courage), you develop the full potential of this card and you can defend and attack with increased value. I consider Blade Mastery as a good card. Though I can’t often find the free place for this event, even I would glad to. I mean in decks with extended card pool. Personally, I prefer the permanent boosting effect of attachments, like Blade of Gondolin or Dwarven Axe, but by adding Blade Mastery to your deck you won’t make a mistake. Where Blade Mastery hasn’t any precondition for playing it, Rain of Arrows has right 3. That isn’t few. Well, under such assumption it should be quite a beneficial effect. However, it doesn’t concern Rain of Arrows. This 1 cost event has an action, where you have to exhaust your character with Ranged keyword and deal 1 damage to all enemies engaged with the player you choose. As I said, 3 preconditions must be fulfilled: 1) exhausting your character, 2) Ranged character must be present, and 3) enemies must be engaged with someone. If we go one by one, then the exhausting character is the first problematic aspect. Leaving your characters ready until you have to act is your natural effort because you have to do many things: questing, defending, attacking, or using some special abilities of characters. Another additional exhausting then should be from a very good reason. Is Rain of Arrows that “good reason”? I don’t think so, but don’t anticipate. The Ranged character is even more complicated limitation. In Core set, we have a small group of Ranged characters. Only Ranged hero Legolas should stay away from this event because he is just too good for it. Of course, if you have some card with readying effect, such as all-powerful Unexpected Courage, then you can afford that. I would prefer Ranged allies as targets for Rain of Arrows and in Core set it concerns in total 2 allies – Silverlode Archer and Horseback Archer. Both allies are vanilla and have average (or under-average, in a case of Leadership ally) stats, so from this point of view, they are perfect targets. The only obstacle is their 3 cost, so making this combo won’t be immediate matter. Last challenge is the biggest. You need some enemies engaged with you or your friends. Well, if Rain of Arrows had hurt enemies also in the staging area or in the engagement area of all players, I would have been more satisfied. Unhappily, you have to choose one concrete place, where to strike. As effective using of this event, I consider at least 2, rather 3 and more enemies. So you have to get in a risky situation, where you face more enemies at once. After all these preconditions you finally can trigger its effect – deal 1 damage to all enemies, engaged with chosen player. Not persuading for me, 1 damage doesn’t cause horror at enemies. Maybe it chases away Eastern Crows or Black Forest Bats, however other non-injured enemies will survive. I know, for 1 cost I can’t require greater effect, I fully understand it. It could be used for damaged enemies, close to death. I can even imagine some “classic” combos with this event, like Thalin, Gondorian Spearman or Longbeard Orc Slayer. The effect multiplies and enemies get good portion of damages. Rain of Arrows is a cheap, but very much situational event. You are dependent on a small band of characters, which have to be ready. In addition, you have to wait until a suitable occasion in order to strike with this event “effectively”. 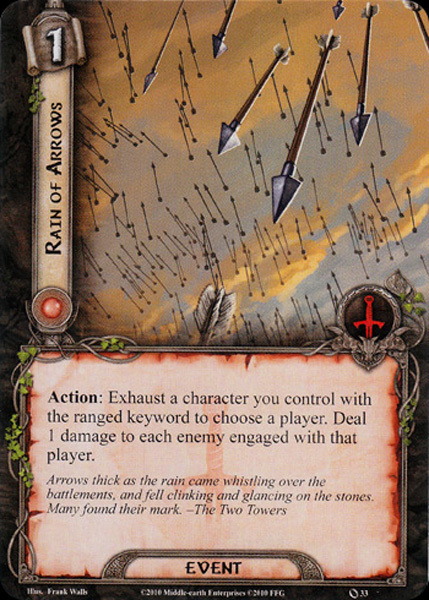 Too many preconditions and relatively weak effect condemn Rain of Arrows to be rightfully often ignored card. If the previous event is often ignored because of its specific and weak effect, then next Tactic event is on the contrary often used because of its universal and powerful effect. Feint is another example of a key card, which comes in handy almost in every situation and missing this card in your Tactic deck can considerably hurt you. As I said before, Tactic events are very cheap, and Feint is another proof. For sympathetic 1 cost, you get a card, which you can play only in a specific phase. We first meet the Combat Action, which says: “Choose an enemy engaged with a player. That enemy cannot attack that player this phase.” This effect gives you an enormous advantage against the chosen enemy. You just skip his attacking for one round, making him defenseless and useless. On the contrary, you can use the opportunity and attack the enemy first. There is no need to say you will use Feint for the strong enemies. Such Hill Troll can smash your characters into pieces and is really dangerous if you are not prepared for him. Feint can paralyze him for one round and give you more time for building your army and/or your chosen strategy. The same is valid for other bosses, unique enemies, or just annoying enemies, which you need to keep them back. Yes, there exists even the same effect in a permanent version. Lore Forest Snare can catch chosen enemy into the net and paralyze him forever. But, it costs 3 and no every enemy can be trapped by attachments, like Nazgúl of Dol Guldur or worse and stronger enemies in further adventures. Feint is certainty that you can rely on at any time. Feint is a strong event – and therefore you need to know when is legal to use it. The timing is important. It’s one of the events that get own errata. Long ago it was legal to use it, whenever you make up your mind. Now you are limited by specific phase – the combat phase. You can think of that enemies always attack you in the combat phase. You have half-truth. Yes, it is usual, but not explicit. !SPOILER! Remember on enemies like Wild Bear or much worse Durin’s Bane, who can attack you during staging, thanks to treachery Leaping Flame. That’s really devastating and unfortunately Feint is short for this encounter combo. So keep your eyes open and don’t forget, that even such great Feint has its own limits. The second thing I should mention is not directly limitation, but characteristic of this card. You need to have knowledge about right using. Now I don’t think the specific phase, but using during the combat phase. At the beginning of the combat phase, you deal shadow card to an enemy. And that’s the time when you have to use Feint according to the rules. There is an action window, where if Feint is not played, you have missed the right timing and Feint is lost for the concrete fight. Remember it and use it legally. Feint is just an amazing card, which is for Tactic deck indispensable like Test of Will for Spirit deck. Preventing of enemy’s attack is the powerful and really helpful effect. 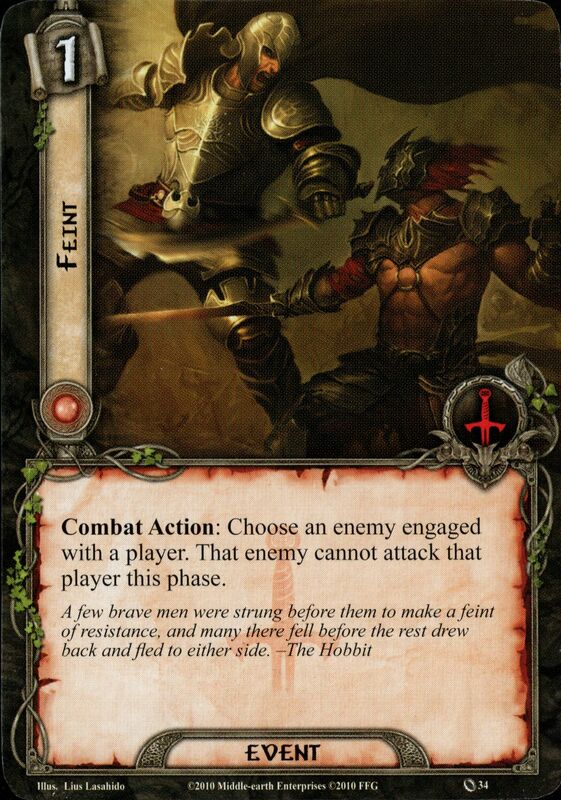 If I would proclaim Feint as one of the strongest and most useful cards, I won’t be far from the truth. The fourth Tactic event, fourth 1-cost card. I really admire cheapness of Tactic events, their comfortable and practical usage. We have got two very good events and one quite useless event. Quick Strike belongs to the better part. When we play this card, we have to exhaust one of our characters and declare him as an attacker immediately against some eligible enemy. The attack will also resolve immediately. I can’t help myself, but the effect somehow reminds me of the previous Feint. The effect is similar – prevent the enemy to attack us. However, the way, how to achieve that, is different. Feint stops enemy to act completely, without any doubts. On the contrary, the effect of Quick Strike prompts our character to attack first, actually overtake our chosen enemy. It has own positives and negatives. The exhaustion of the character here is not the problem because for every attack you usually have to exhaust character in order to attack. So nothing special or additional is done here – we can attack in common way as we are used to it, only one step ahead. Which enemy we can attack? Only that eligible. In other words, nothing special is done here as well, we just attack the enemy in our engagement area (or engagement area of other players, if we attack with Ranged character). It’s the answer to the unspoken question if we can attack the enemy in the staging area with Quick Strike. No, you can’t, if you haven’t a hero or an ally with the appropriate special ability (Dúnhere). Now the only question, which we should resolve, is: when to use Quick Strike? Certainly, you will use this event anytime before resolving enemy attacks. After that it’s not wise or practical, you would just miss the right moment. Most often the Quick Strike is used after the encounter phase and before attacking enemies in the combat phase. But you are free to use it even sooner on the enemy, which is engaged with you from the previous round, for example in the planning phase or during the questing phase. The problem in such a situation could be that you will play Quick Strike too soon, without any knowledge, with what encounter deck comes this round. That’s somehow hazardous – you attack some annoying enemy, but after staging you find out that even worse foe appears, which should be eliminated in a first place. Therefore I advise you to play Quick Strike after the situation on board is set this round. I have found one interesting point, related with Quick Strike that could confuse new players or even advanced players. I must confess that I took a look into the rulebook, FAQ and read some discussions if I understand this card well in advance mode. And I have been mistaken until now! The question is: Can I use Quick Strike and then attack the same enemy in the same round with the same character, after some readying-effect? I thought that it is against rule, but then I have read it directly from FAQ: “However, if a player makes an attack against an enemy by a card effect such as Quick Strike (CS 35) or Hands Upon the Bow (D 131), that is an extra attack and does not count against the limit of 1 attack.” It’s good to know, when you attack some enemy with Quick Strike, that you can repeat it again in the classic combat phase. When we are at attacking enemy, let’s compare it with previous event Feint. What is better to use? Feint or Quick Strike? Both have a very similar effect, as I have pointed before. However, there exists a little difference between them. When you use Feint, the enemy just doesn’t attack and stay frozen this round. Simple. With Quick Strike, it’s a little bit more complicated. If you want to use Quick Strike in the best way, that means killing the enemy just before he can act, you have to fulfill two basic preconditions: 1) owning very good or boosted attacker, and/or 2) enemy has as many Hit Points as you can destroy him by your chosen attacker. If not, enemy survives and he can strike you back and damage or even kill another character. You have to own for example damaged Gimli, who can smash enemies by one attack, or you have to attentively count enemy’s Hit Points. And that’s the weakness of this card. Yes, under some circumstances it can behave as a permanent solution unlike Feint, which solves your situation one round. But if you can’t defeat the chosen enemy by a single attacker, then Quick Strike doesn’t resolve anything – you just attack with one character one step before combat will truly begin. On the other hand, Feint prevents the enemy to attack, you are free to attack with more characters at once and you more likely send the enemy to encounter discard deck. What is the conclusion? Well, unlike more universal Feint, Quick Strike works more specifically and in a proper situation. From this view, we can use Feint anytime and its effect is constantly perfect. Quick Strike can or needn’t save you from enemy’s attack. Feint is a winner for me, but I don’t damn Quick Strike. I see it as a useful card, with which you just need to learn the right cooperation and utilization. After 4 very cheap events suddenly comes 3-cost Thicket of Spears. You may believe it or not, but this card is “elite” representative of Tactic events. 2 resources less than another “elite event” Grim Resolve. Yes, it’s relatively good to spend only 3 resources. But the main cost lies somewhere else. You can read the main cost at the beginning of the text, just before its action. You must pay 3 resources from 3 different heroes to play this card. That’s another talk. After reading the text I may rather pay 5 resources for it… 3 resources from 3 different heroes mean in other words that you have to play from the beginning with 3 Tactic heroes. It doesn’t seem like a wise option, because as we know, Tactic has a huuuuge problem with questing due to low or non-existing Willpower. I sometimes build a deck from 3 Tactic heroes, but only in dual play, where a second deck logically abounds with Willpower characters. In a solo game, it is unplayable, at least in Core set. !SPOILER! Of course, in further packs, there is an elegant way, how to resolve this limitation. Song of Battle enables you to “create” Tactic hero from a non-Tactic hero. Now to action: “Choose a player. That player’s engaged enemies cannot attack that player this phase.” It’s like Feint in multiple version. You prevent enemies to attack you, or enemies of other players. For one phase you will get the rest from fighting and so you can prepare in the next round. When I was playing my game, I was surprised by the practical usage of Thicket of Spears. Quite often I have utilized its service and have stopped enemies from attacking me. In many scenarios, you stand against more than 2 enemies. 3 is number, where I would start to play Thicket of Spears because a lower number of enemies wouldn’t absolutely worth it. And 3 enemies is also the number, where you start to have a problem defending them all and at the same time striking them back. Or at least if you haven’t sufficient amount of allies. Then this event will come in handy. The timing of playing Thicket of Spears is something different than at Feint. Why? Because before action word “combat” is missing. Contrary to Feint you are free to use this event even out of the combat phase. However, can that situation happen in reality? Even theoretically not. Enemies, which have an ability to attack you out of the combat phase, attack individually, not in the groups like during combat phase. So again, playing Thicket of Spears on a separated enemy isn’t wise from any point of view. You feel that I wanted to summarize it somehow like “Feint is better and more practical than Thicket of Spears.” You are right, I will say that because it is true. Though I also have to say in one breath that Thicket of Spears is very good card with a quite ultimate effect, no doubts here. Preventing foes to trample you to the ground will always be useful. But paying 3 resources from 3 different heroes makes this card far more complicated and limited – you have to own 3 Tactic heroes, or have to other solution to “bypass” this precondition. Here comes the event with my favourite image, though it doesn’t belong to an artistic jewel. Warrior with sword bashing some orc to the face. That’s the Swift Strike, similar by name to Quick Strike, but with totally different effect. Swift Strike with 2 cost is one of the more expensive Tactic events. Still, I consider it a good and easily achievable cost. This event is triggered immediately after declaring character as a defender and you deal 2 direct damage to the attacking enemy, without considering its Defense. We have here the stronger Gondorian Spearman in event variation. I appreciate the effect of the mentioned ally, so if I get something similar in a stronger version, I’ll surely applaud. I love direct damaging. It’s something that makes your game easier when you hit the enemy without any penalty. And if you won’t kill an enemy with this event? Never mind, even after that the enemy gets his own 2 damage and you can finish him in next attacking step or later. You know, sometimes the hitting enemy can be very hard job. That’s the case of ultimate defenders, who has 3 and more defense. During cycle Shadows of Mirkwood, we meet many of these tough enemies, where it will be the challenge for you to damage them. Swift Strike supports you in this effort. I just admire Swift Strike, it helps me a lot in games. Though I can find one weakness and you will find it for yourself very soon as well. ONE copy of this event in Core set is just depressing. I don’t know if even two copies would be such problem for designers, but one Swift Strike in a deck is so few and painful that you have really small chance to draw it into your hand. Then you have to make the right decision about the right timing of playing because you have only one attempt. This hasn’t really succeeded. If you don’t buy at least second copy of Core set, then Swift Strike frees its place to other cards, which needn’t so great effect, but they are available in more copies and you have better chance to draw them at the same time. What to add more to this event? It’s good cost and perfect effect causing many enemies perceptible injury. After Swift Strike, you can kill an enemy more easily and in shorter time, if he isn’t already dead. It’s shame we haven’t more cards with similar effect. Maybe it’s good after all –fighting with enemies wouldn’t be so much challenging and exciting. On the contrary of the previous event, which was pretty clear and no misunderstanding could come, this last event was so unclear and confusing to me that I have refused to use it anytime. Now I’m writing the review about all player cards and I can’t skip Stand Together just because I haven’t understood it. So what I had to do before writing this review? Open the community forums, FAQ and discussion and search for answers. It’s because the effect of this event isn’t absolutely well explained, therefore arise a “creative space” for rule interpretation. This event is for free, so at least one characteristic of this card is obvious. And what’s the mysterious action? You choose a player, who may declare any number of his eligible defenders against each enemy attacking him this phase. The game text suddenly ends here, without additional explanation. 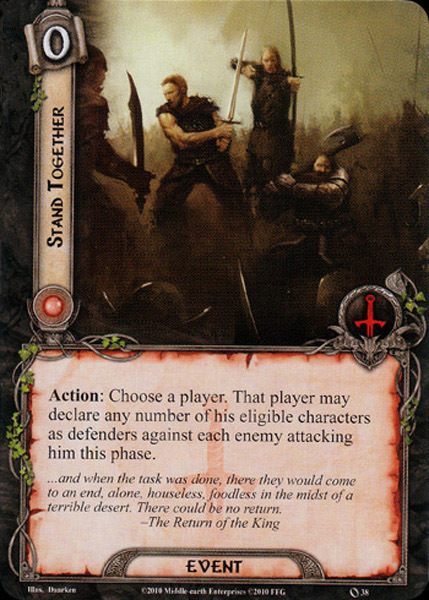 As a new player, I would have one big question: for what is Stand Together good? What advantage results from multiple defending? Let’s open official LOTR FAQ, what does it say about multiple defending, because it’s the key to understand this effect: (1.04) “Damage and Multiple Defenders: If a player uses card effects to declare multiple defenders against a single enemy attack, the defending player must assign all damage from that attack to a single defending character.” Yes, that’s definitely important note, but I have to mention the main thing, without you would still be lost. You add up all values of Defense of all characters and remaining damage you assign to one of the defenders. It’s exactly the same principle when you attack by multiple attackers, you also add up Attack of all characters, subtract the Defense of an enemy and remaining value you assign to that enemy. Instead of Attack value, you adding up Defense value. And what means “…That player may declare any number of his eligible characters as defenders against each enemy attacking…”? In this round, you are allowed to defend in this special way any number of enemies. So two enemies are attacking you, both of them you can defend by any number of defenders. That’s another little, but good detail. How it is in practice? I can’t speak from own experiences, I haven’t played this card yet. But I’m planning to. In theory, I can imagine some nasty, big and powerful enemy like Hill Troll, who increases your threat by each exceeding point of damage. With 6 Attack it’s pretty high chance that this will happen. Use Stand Together, choose some characters with good Defense values and fend off his Attack. No characters must die if you get enough overall Defense value. And if damage exceeds overall Defense value, then remaining damage you assign to only one defender, you won’t split up among defenders. Stand Together, however, should be played in a moment, where you have the sufficient number of capable defenders and you confront only one strong enemy, or else no more than 2 enemies. With more enemies you will have a problem to defend all, you would have to sacrifice some ally or let some attack undefended (what is always risky matter). I’m proud of this relatively long review about this event, which I haven’t even hold in my hands. This card is… not so bad, as it seems at first sight. It has the miserable game text, which doesn’t explain the action fully. When you understand it, it’s a quite simple effect, which has its own, but specific utilization. You can use it in scenarios with strong enemies. It even doesn’t cost you anything. However… I think, you rather decide for other available, more universal options in your deck. The Tactic sphere has excellent events and for the attachments, it’s true as well. Blade of Gondolin is the cheap weapon, small but effective. What we get for merely 1 cost? Our first Tactic attachment you can attach only to heroes and you have to count with Restricted keyword, so one Blade of Gondolin and only one place for another Restricted attachment remains. When your hero is equipped with Blade of Gondolin and you meet an enemy with trait Orc, you may enjoy +1 Attack to attacking value of your hero. 1 cost and permanent +1 Attack isn’t bad at all, compare with Blade Mastery, which has from half same effect, but you enjoy increased Attack only for one phase. Of course, +1 Attack at Blade of Gondolin is valid only against Orc enemies. No giants, no bats, no undead or spiders. But how often you face all these disgusting, slimy and malicious Orcs? Almost in every scenario, you meet a group of these enemies, they are your main arch-enemies. In term of Core set, you can encounter from overall 19 enemies 8 Orcs. But most of them are in 2-3 copies in each scenario, so there is a really big chance you will stand against a couple of them. And what is better for their extermination than specialized Orc-slayer weapon? Blade of Gondolin has one another surprise for us: its response. After attached hero attacks and kills an enemy, you may place 1 progress token on the current quest. Little rule insertion: “current quest” here could mean a location if some is active. You place at first progress tokens on active location, then on quest card. I think, that 1-cost attachment possessed by 2 abilities is just great. Such a small and almost inconspicuous weapon can make you a smile. It pleases you when you destroy your enemy with help of Blade of Gondolin, and in addition, you add 1 progress token and move one little step forward. LOTR LCG is sometimes just about these little details, which altogether can decide about your winning. Let’s return from praising back to response itself. Same, but stronger effect we have met at Legolas. From experiences with playing Legolas I know, that putting progress tokens after questing phase can bring you an interesting advantage. You can react to new rules of just revealed quest card better, then right after the questing phase, where you have to go through whole encounter phase and combat phase, two very key phases. Many revealing effects of quest cards command you to add X encounter cards to the staging area, what could be a serious problem, if you are not prepared for some “unpleasant surprise”. At the end of the combat phase, you needn’t care of it, because no enemy will engage you this round and you can prepare better for the next planning phase. Okay, now imagine the situation, where Legolas fights with Blade of Gondolin. 1, 2, 3 progress tokens you add to the current quest (active location) and man, that’s a huge bunch of progress tokens for one attack. Attach to Legolas Unexpected Courage moreover, attack twice in the round and you will fly through your quest. Unbelievable combo, which I have experienced many times. Highly recommended. From the above review, it follows, I am pretty satisfied with Blade of Gondolin. But it’s enough from my side, you must try it yourself and taste the usefulness of this weapon on your own. 2 or 3 copies of it would appear in your Tactic deck quite often. Well, well, what we have here for now? If Blade Gondolin was a light weapon to a lesser skirmish, then Citadel Plate is heavy armor to wild great battles. Sometimes good weapons aren’t enough and you need arm yourself by some nice piece of steel. Attacking is important, but you have to survive defending first. And Citadel Plate helps you in this effort to a great extent. Prepare 4 resources for playing this attachment. It’s not cheap armor at all, you have to save thoroughly your resources and it won’t be maybe in 1, 2 or even 3 rounds, because meanwhile you should build your army, play some events, maybe some useful attachments… and then Citadel Plate comes into a play, you attached it to a hero, who are only available targets and celebrate your success. Yes, getting Citadel Plate isn’t easy – but from its power, you should profit for a long time. Armor is Restricted – got it. The remaining Restricted attachment could be some weapon, like Blade of Gondolin or Dwarven Axe, then your equipment would be complete. Everything is about one thing, more precisely boosting: hero gets +4 Hit Points. Boosting Hit Points was a last kind of stat-adjustment, we haven’t still met yet. Until now, with appearing Citadel Plate. 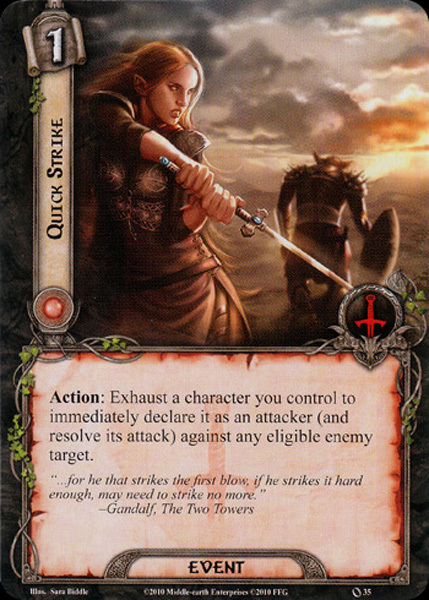 Boosting Attack, Defense or Willpower is a common effect of various cards, we have Blade Mastery, For Gondor!, Blade of Gondolin, Celebrían’s Stone and more others. But making your character tougher by simple increasing of his Hit Points, which directly determine his vitality? New players could be surprised – it belongs to the rarest stat-boosting at all. 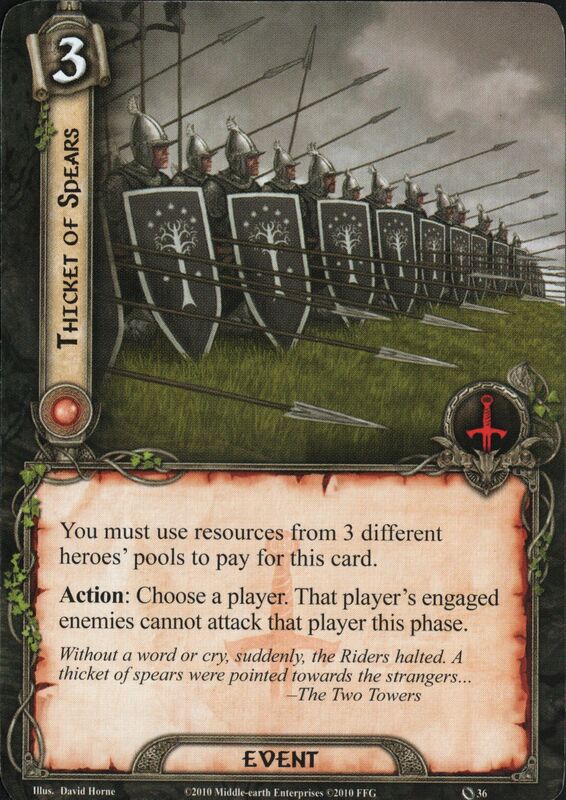 In Core set we have available only Citadel Plate, next card, which would adjust Hit Points, you encounter… just later. !SPOILER! It will be even beyond Shadows of Mirkwood cycle, in next expansion Khazad-Dúm. More specifically, Boots of Erebor. I think it’s quite a pity that the only way to boost Hit Points is very expensive Citadel of Plate. This effect should be more common and accessible. So +4 Hit Points is a very robust boost, protecting you from the quick death. Citadel Plate makes from fragile heroes like Éowyn or Eleanor pretty viable heroes, where Necromancer’s Reach or some unfortunate shadow card let you cold. However, I really can’t imagine you will attach Citadel Plate to these heroes. None of them are made for defending, so attaching them Citadel Plate would be waste of resources. More interesting target seems to me Denethor, also with 3 Hit Points, but he is the regular defender. In connection with 3 Defense, you create the impassable wall. Citadel Plate will make happy other good heroes with good defense, like Aragorn, Glorfindel or Beravor. But two of heroes are utterly predestined for this attachment: Gimli and Glóin. The reason is simple: both heroes profit from the number of damage tokens on them. From Gimli, it makes a killing beast and from Glóin inexhaustible well of resources. Citadel Plate extent their abilities to the new dimensions. And imagine the situation, where you add to one character two Citadel Plates… Just don’t forget that discarding Citadel Plate from the attached hero, whose number of damage exceeds default Hit Points, does from your hero pile of dead meat. Citadel Plate is a cool and strong card, there are no doubts about its significant effect. Still, you will have a problem to get it on the board, because the Tactic sphere isn’t a very resource-friendly sphere, despite very cheap events. You will probably often experience the situation, where you have Citadel Plate in your hand, but you are not able to get it into a play, because you have to first do this, then this, and this… and you are still fighting with available resources for playing this attachment. Citadel Plate then remains as a luxury, about which you can think if you have resolved sufficient resources income. However, I see it as the only negative of this card. Dwarven Axe is a third Tactic attachment and second Weapon in Core set. We equipped the light weapon Blade of Gondolin, then we dressed heavy armor Citadel Plate and to complete our equipment, we need some proper weapon. Now we are weighing the heavy axe, which seems very dangerously, at least from the image. Could it be redoubtable enemy-slayer? For Dwarven Axe we must pay 2 resources. That’s a good average price. As all previous Tactic attachments, only heroes can enjoy this Weapon, and we have count with Restricted keyword again. Restricted is somehow in Core set very popular. Now let’s look closer, what this axe can do. The attached hero will gain +1 Attack permanently. Well, here the disappointment could come. 2 cost for +1 Attack? Give me a real weapon, not this costly attachment, which pretends to be a weapon! Nope, this isn’t the whole story of Dwarven Axe. Read on the text in brackets. Your hero gains +2 Attack instead if he is a Dwarf. That’s the main message! We have realized now that we have met another, very rare (in Core set), trait-synergy card. The first was Leadership event For Gondor!, now it is a Dwarf trait, which comes to the forefront. I said it once at For Gondor! and I’m saying it again: traits will have a very important role in our deckbuilding. From the start, we have only limited possibilities, with expanding card pool we realize that traits will significantly facilitate our games. So from this point of view, we know that Dwarf characters are becoming our target for Dwarven Axe because any other character wouldn’t utilize this attachment at maximum. In Core set, there exists 3 adepts for this attachment: Glóin, Gimli and Thalin. Attaching Glóin and Thalin means overall 4 Attack for both, and 6 Attack, if we add one more Dwarven Axe. I consider this as a quite solid battle arsenal. You would destroy the majority of enemies with one smash, and big monsters would feel your attack very painfully. Unfortunately, both dwarves have other tasks than attacking, at least in ‘normal mode”: Glóin occupies with defending and Thalin goes to the quest. So without some readying effect, you wouldn’t use them as attackers. But Gimli… that’s the natural target for Dwarven Axe! Unhurt Gimli gets 4 Attack, same as previous dwarves. But let your Gimli hurt from enemy… he firmly grips his axe and with terrifying strength, he makes his ultimate counter-attack. Fully damaged Gimli with Dwarven Axe reaches 8 Attack. With second Dwarven Axe it makes 10 Attack, Citadel Plate instead of one Dwarven Axe boosts Gimli’s Attack to value 12 Attack! It’s the magnificent demonstration of Gimli’s offensive skills, of course, if we don’t count boosting events Blade Mastery or For Gondor!. Dwarven Axe belongs to very good Weapon. If you haven’t any Dwarf hero, then I consider this attachment as pretty expensive and unbalanced (2 cost for +1 Attack). When you add it to a Dwarf hero (especially Gimli), then attacking becomes more pleasant matter. So I wouldn’t call it as the universally good attachment, but Dwarves will be definitely satisfied with this weapon. We say goodbye to Core Tactic sphere with last unique attachment, Horn of Gondor. Forget on equipping weapons or armors, put the horn to your mouth and call for help, when the situation is critical! Horn of Gondor is for 1 cost – what else we can wish? Again, only heroes can use this attachment and you have to agree with Restricted restriction. Horn of Gondor can boast of this clear Response: “After a character leaves play, add 1 resource to attached hero’s pool.” So that means, every leaving character from the play will generate 1 resource… wait a second, have I just said leaving character? I have to confess that I lied. But I only repeated the text on the card, have I missed something? That could be a question from new players. Yes, text on the card doesn’t reflect real and official game text now. According to LOTR FAQ (version 1.8), Horn of Gondor gets its own errata. The reason was clear: overpower. However, the errata was pretty criticized by the community because of breaking its strong effect. From these days, no combo with Sneak Attack was legal again. No another Steward of Gondor in Tactic version anymore. I understand the disappointment of players in the community when they have found out the shocking news about their favourite Horn of Gondor, on which they based their game. And when I have mentioned Steward of Gondor – it doesn’t get any errata and still, it’s very powerful (maybe also overpowered?) attachment. Well, it’s not my job to review the decision of designers about errata. It’s done and present. I personally think that it hurts to Horn of Gondor’s reputation and limits its usage, but I don’t see it as the end of the world. Still, Horn of Gondor has own value, even with the errata adjustment. And what’s the official text of this card? “Response: After a character is destroyed, add 1 resource to attached hero’s pool.” Replace the word “leaves” with the word “destroyed” and you get final form of Horn of Gondor. Adding 1 resource for each destroyed character is… or should be good. However, isn’t your aim to prevent your characters die? Should you protect them? Yes, of course you should. But practically you will face to the destroying of your allies by the enemies because allies aren’t in general so good defenders and viable characters as heroes. So consider chump blocking for standard strategy, which you have to accept if you want or not. From this point view, Horn of Gondor is the logical answer on destroyed characters, where adding 1 resource serves as a very good compromise. At least, one more resource contributes to your effort in playing another character. Damn, it’s better than gain nothing! You should take it with humility and respect – Horn of Gondor enables you to somehow act if you lose one or more characters. I should be more precisely: when anybody loses a character. I see it as an attachment with the great possibilities in the multiplayer game. More players, more characters, more resources. It’s fine for me. Horn of Gondor is lighter, Tactic version of Steward of Gondor. Even after errata, which have surely influenced the utilization of this card, Horn of Gondor works in any Tactic deck quite well. Adding 1 resource for the destroyed character means one of the resource-generating possibilities, and you certainly attach it to hero from sphere, which has the problem with expensive cards (Lore sphere, but also Tactic sphere itself). 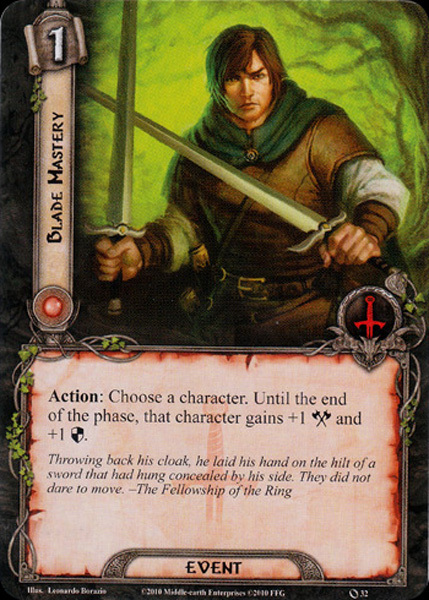 But despite its cheapness, Horn of Gondor is unique – once you get it into play, means that other possible copies become very useless. I am satisfied with only one copy Horn of Gondor in my deck if I find the place for it. 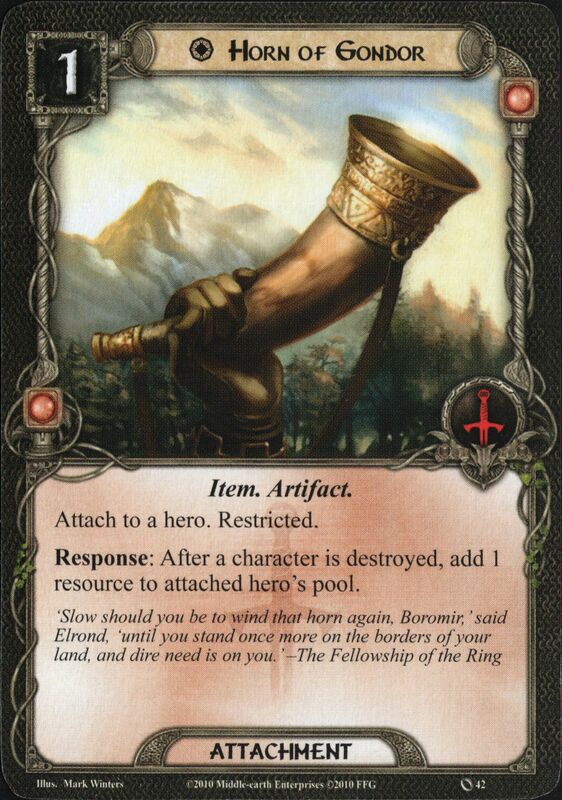 Compared to Steward of Gondor, Horn of Gondor is not so powerful, but in the Tactic environment, you couldn’t wish more. Heroes from Tactic sphere are distinguished well, each of them has a different method, how to harm your enemies. I evaluate all these 3 heroes very positively because they can find a place in your deck even beyond Core set and other adventure packs and expansions. Core Tactic sphere offers us a smaller number of available allies than Leadership sphere, though I’m admitting that each ally has own price and all of them are playable. Veteran Axehand and Horseback Archer are more perfect copies of their under-average “cousins” from Leadership, Guard of the Citadel and Silverlode Archer. In fact, their stats differ by mere 1 stat point in Attack, what makes from them far more useful allies than their Leadership colleagues. Yes, you can argue that thematically Tactic sphere is specialized in combat, whereas Leadership is specialized in… in what actually? Leadership is not specialized in any of these actions – they are aimed for balance in order to do almost everything, but not to be specialized in any of these actions. Though if you are not fans of reading long ability-text and you think about adding of some vanilla allies, go for Veteran Axehand and Horseback Archer. Gondorian Spearman is a great helper and makes the quality job in the combo with Thalin. Dealing additional 1 damage before attack resolution can decide about enemy’s death, without any pain to you. If you run Tactic deck, Gondorian Spearman should be auto-included. And great Beorn is getting very hard into a play, because of his 6 cost. But his stats make from him “half-hero” able to stand against the strongest enemies. I have no problem to put together Tactic deck from just Core allies because you won’t find here any “trash” ally. They are strong in the action, for which they were born – attacking enemies. No side activities, just ready to fight and kill enemies. From Tactic events, we have got a wide choice, how to deal with enemies encountered with your or your friends. There is nothing simpler than prevent enemies to attack us. Thanks to it we gain an advantage in form of “first attack” and destroy enemies sooner than they would pull together. Feint is such an example of this kind of effect. Very useful, very simple and so brilliant event. “Mass prevention” of attacks arranges Thicket of Spears, however, you have to own 3 Tactic heroes in order to play it and that’s unfortunately very limiting – solo monosphere Tactic deck has own weaknesses (almost non-existing Willpower and questing abilities). Quick Strike has its own recipe for surprising enemies – hit first. Although Quick Strike doesn’t prevent an enemy to attack, with the first attack you have a chance to hit and kill an enemy before he could do that same to you. This event needs the presence of some good attacker, for example Gimli. Boosting Attack and Defense of Blade Mastery can be also a bit useful effect, though it isn’t so emphatic event as previous ones. Next option, how to fight with enemies, is hit them through direct damage. Apart from Thalin and Gondorian Spearman the Swift Strike is able to hit an enemy directly. You have to declare a defender for working this card, but you deal 2 damage, what means for weak or wounded enemies automatic death. The key is right timing of this event, just wait on a moment, when the enemy is damaged enough so that Swift Strike could kill an enemy itself. Rain of Arrows wants to gain our attention as well. It’s shame that you need so many conditions to the proper working of this card: the presence of Ranged character, exhaustion of this character, enemies engaged with one player. The last event, which goes an absolutely different way, is Stand Together. Declaring any number of defenders against attacks of enemies seems quite… chaotic. At least at first sight. When you realize that you can combine Defense values of more defenders, then it doesn’t seem so bad. But I think you need some experience with it and still I think, we have better and not so situational options, how to defend well. Tactic events from Core set unequivocally show us, how they want to deal with enemies. No basic effect, which we meet at heroes, allies, or attachments, is missing here and we have the use of diverse ways to fight with servants of evil. It’s also good that Tactic events are pretty cheap, the most expensive is 3-cost Thicket of Spears. I am sure you will choose from Tactic events and you will often come back to them. Weapons, armors and… horns. We may expect these types of attachments in Tactic sphere. Yeah, we have to equip something sharp and resistant, if we want to measure forces with dangerous enemies. 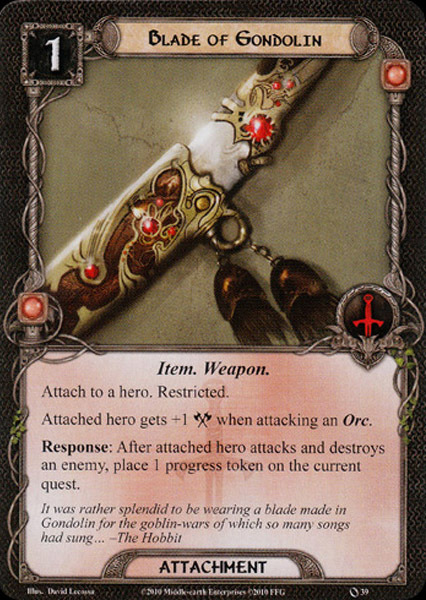 Blade of Gondolin specializes in combat with Orcs, with which it gets +1 Attack. Not every enemy is an Orc, though many scenarios overflow with them, so take into account traits of enemies, or you could be unpleasantly surprised you have equipped almost the useless weapon. At least you give an extra bonus for killing enemies in form of generating progress tokens – that’s the partially answer on lacking Willpower in the Tactic environment. Dwarves can be happy by the existence of Dwarven Axe, which boosts them solid +2 Attack. Other non-Dwarf heroes must put up with only +1 Attack, which isn’t good exchange for 2 cost. Do you need some fair piece of armor? Get Citadel Plate. You have to save 4 resources for playing it, but boosting of +4 Hit Points belongs to a very desired effect. Some heroes like Glóin or Gimli benefit from Citadel Plate more than others, because the amount of damage makes them stronger – either in form of boosting Attack or in form of resource generation. When I have started to speak about resource generation, Tactic sphere has own card, which allows us to generate this commodity – Horn of Gondor. Despite its errata, we have got a powerful attachment, which transforms the death of characters into a resource generation. I can’t say anything bad about that 4 Tactic attachments, which we have in use. Although Blade of Gondolin is an attachment depended on the presence of concrete kind of enemies, you shouldn’t overlook its secondary effect, so perfect in combo with Legolas. 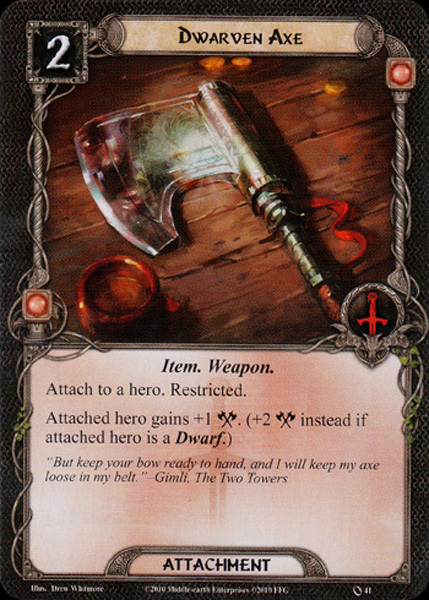 Maybe Dwarven Axe will be losing its shine and sharpness from a certain moment, but until that moment Dwarven Axe has never been missing in my decks with present Gimli, Glóin or even Thalin (with Unexpected Courage ;)). The Tactic sphere is the only one from the Core set, where I am pleased with each type of cards – heroes, allies, events, and attachments. We don’t have to make some compromises, choose carefully and attempt to use some useless card, in order to fill a deck with the maximum number of cards. The Tactic sphere has very clear conception and shows us from the very beginning, what we can expect from this red sphere – specialization in combat and everything connected with it. If you want to pure power, choose Tactic sphere, it won’t disappoint you. Remember just one fact, which accompanies Tactic sphere – you can’t quest effectively, because you will lack Willpower. You need to support Tactic sphere by capable questers, for example from Spirit sphere. If not, you will probably fall during inability to quest and make some progression.